I have a vacuum return system in a building I am having some trouble with. I was at this building 1 other time a couple weeks ago. The system is essentially a standard Mills system with down feed risers, and the return side runs to the vacuum pump instead of a typicall condensate reciever. The complaint is poor distribution of steam. There are 2 boilers and they claim one is enough by itself until its really cold to heat the building. The only way I could get steam everywhere was to fire both boilers. The vacuum pump will make 10" when I close the inlet valve, so I know its capable. The boilers never make pressure on the gauge, just linger around 0 even with both boilers running. I guess what I want to know is what is the next logical step. This is a large building, they claim the traps were all surveyed and replaced as needed, but that was a 2 years ago. Its not practical for me to take a radiator survey to prove EDR ratings needed. How should I proceed? Should the vacuum pull down all the way to the boiler when the boilers are off? If so, this does not happen - does that mean system leaks? First off it sounds like you have a leak. How many cfm is the vacuum pump? When the system was new, it would have needed 1 CFM for every 1000 square feet EDR. But over time the system develops leaks and could use some added capacity. Do you know what the vacuum switch is set to? Typically the pump would cut out at 8" and cut in at 3", maintaining 5". On Startup, the system is cold and the traps are open, so the vacuum should reach the boiler. How long does it take to make 10" with the inlet closed? And what info do you have on the vacuum pump? Most likely a leak. I'm sure it's a big building and it will be a long day of walking around, but it will be worth it if you save the day. Im going there this afternoon. The vacuum will make 10" before it shuts off when the inlet valve is isolated. I was thinking leak also. I need to prove there is a leak first. How can I go about that? Maybe its simpler then I think. There is an odd arangement of check valves in the vent line from the vaccuum pump, and that seems to pulse - is that normal? Most if not all the piping is buried in the walls, and its a condo, so I have limited access. I dont have any info on pump capacity at the moment. Thanks for the help. I will gather more intel and post what I find later today. Also, from what I recall, the vacuum level hardly exists once I re-open the valves, but I could feel suction when I opened a union at one of the radiators that was not heating. Maybe I need to make sure the check valve in the equalizer is working right. When both boilers are running do they build any pressure? I've never known a check valve to pulse. The vacuum exhaust line should only be blowing air out, you should not feel air sucking in at any moment. I would contact a company that makes the vacuum pump or one just like it and ask them how long it should take to satisfy the vacuum switch with the inlet closed. I would think that it should take less than a minute to pull a vacuum on nothing but the condensate receiver tank. When I close the inlet, the vacuum reaches 10" almost immediately. But when the valve is open, thats when the vacuum never makes. Also no pressure over 0 psi at the boilers even with both running. There are some screw ups with the header, ie the take off to the building is between the supplys from each boiler, so thats not helping but its been that way for over 30 years if not more. They claim it worked last season, but Im not sure I buy that. Was the vacuum pump original to the system? so it sounds like the vacuum pump is working. It's possible that some of the tenants could have been playing with the supply valves in a attempt 2 throttle the radiator. If somebody starts messing with the valve that hasn't been touched in decades, the packing's on the radiator valves could be leaking. Or maybe they were closing the supply valves when they were changing the steam traps. In any case it sounds like you have a big leak or several small leaks. Another way to confirm a leak would be too watch how much water you're feeding into the system. If you're taking in more water then the system has before, that would be another indicator that the system is leaking. If this was not originally a vacuum system, the radiator valves are probably not packless valves. Part of the problem there is that its a condo building and individual owners remodel and use who-ever to do work. Would the use of the wrong valves alone be enough to cause no vacuum development? Valves with packing glands will pull in air. Combine that with other leaks and you're going to have distribution problems. Well, I never made it there. Turned out there was a power issue keeping the vacuum pumps offline. They figured that out and cancelled todays call. Im sure I will be back to fight that building another day. In general though, lets say there are leaks other then the radiator valves. What would be the logical procedure of finding leaks on the vacuum return lines? Especially when they are inside walls? Can you tell us what generic type of vacuum pump is fitted? Water venturi, liquid ring, or maybe something else? Brand name and model information? And finally, what is the temperature at the pump's inlet? High temperature can just kill the performance of a vacuum pump, regardless of brand or generic type. There is a relatively simple way to measure the air pumping capacity of a vacuum pump. This involves installing an orifice of known size that is open to atmosphere and connected to the vacuum pump's inlet. Air through the orifice should be the only source of air that the vacuum pump sees, so other possible air sources should be blanked or valved off. I have tables that show the ACFM of the vacuum pump when pulling air through one or more orifices of known size, and knowing the resulting vacuum, my tables will tell us the ACFM. Answers to above questions will help determine what size orifices should be used for testing your vacuum pump. I'm confused about your saying this is a Mills System. A quick search through TLAOSH doesn't show anything about vacuum pumps being used on Mills Systems. Could this possibly be a Paul system where separate air lines piped to a vacuum pump are used to remove air from the rads? At this time I have no specific details of the vacuum pump. It is a duplex venturi style like a shipco - the style that uses the same pump for vacuum and to pump out condensate. It may even be a shipco. Similar to the attached photo. When I said its essenially a mills system, I meant that the steam main leaves the boiler goes to fhe attic, and all the branches downfeed to the radiators, and for what its worth, there is a good chance I misused the term. Its not a paul system. Its a two pipe, down feed, vacuum return system. I can only echo @AMservices comments. A common problem is undersizing the ACFM air capacity of the vacuum pump. I recommend one ACFM per thousand square foot EDR. Many manufacturers recommend much less, say 1/3 of an ACFM per thousand square foot EDR. This lower sizing is okay if all the traps are in good condition and there are no air leaks in the system. 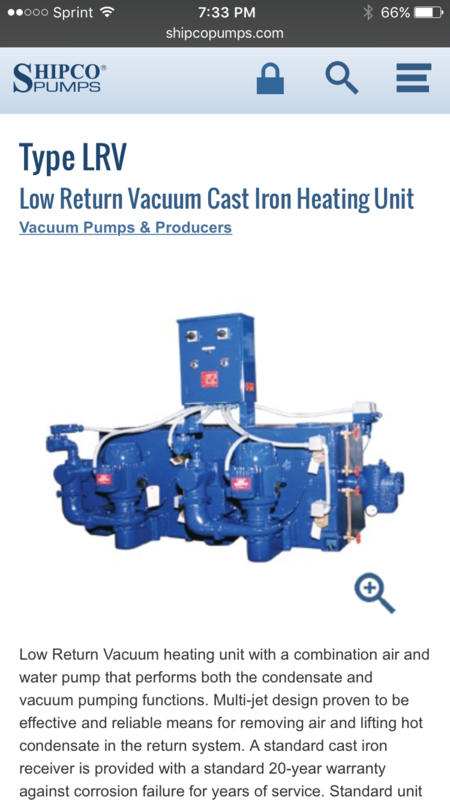 Recognizing that vacuum pumps are now all installed in old buildings, it is always best to go with the most ACFM capacity that is practical to install. Does this system have any zone valves on the steam supply side? If yes, there should be a working equalizer line coming off the top of the steam header, just downstream from each zone valve. This equalizer line should be uncovered, and run through a dropped swing check valve or thermostatic radiator trap, and then drop down to a return line. These equalizer lines prevent vacuum from condensing steam holding up condensate in the header. When condensing steam creates a vacuum lower than what's in the return line, the equalizer check valve or thermostatic trap opens, equalizing the pressures, allowing condensate to gravity drain to the vacuum pump's receiver.